The main function of Nutrakey Glucosamine/Chondroitin/MSM is to help relieve the pain in your aching joints. My first-hand experience with it shows to me that it works well. I have had pain, stiffness, and reduced movement in my left elbow as a result of multiple fractures in the same location. Before taking this supplement there were many workouts that I coudn’t do many upper body exercises like push ups and overhead presses. Taking Nutrakey Glucosamine, Chondroitin, and MSM capsules has reduced the pain greatly and made it possible for me to do them again. After reading this review you will know how it can help you too. Several scientific studies also show that it’s main ingredients – glucosamine and chondroitin – don’t only decrease pain but also repair and regenerate damaged cartilage that’s causing it in the first place. This benefit makes it possible for many of us may be enough relief to return to doing exercises, WODs, and activities that you weren’t possible due to pain and reduced movement in your joints. Is that every serving contains dosages for each ingredient that are shown to be effective in peer-reviewed clinical studies. When taken as directed, this makes it more likely to produce the desired results. This is a very important distinction from other products. Most of them only contain a sprinkling of these ingredients which is one of the reasons they rarely work. This glucosamine/chondroitin/MSM supplement has several other benefits. I’ve listed them for you below. Every nutrient is dosed in amounts that are proven to work in several studies. Value. A bottle will last 30 days when used as directed. It doesn’t contain any fillers or worthless ingredients. It’s hypoallergenic formula makes it safe for almost everyone and any diet. Contains no yeast, dairy, egg, gluten, corn, soy, wheat, sugar, starch, salt, preservatives, or artificial color, flavor, or fragrance. Glucosamine Sulfate (1200 mg) – gets into your joints to decrease pain and inflammation and generate the growth of new cartilage. Chondroitin Sulfate (800 mg) – works at the surface of your joints to decrease pain and inflammation. Hyaluronic Acid (30 mg) – increases the fluid within our joints to lessen pain and improve your joints shock absorbing capabilities. MSM (methylsulfonylmethane) (600 mg) – helps decrease inflammation in your joints and grow new cartilage. Now that you know how it can benefit you, it’s time to answer the most commonly asked questions we receive about this product. If you still have a question after reading, please send us an email. We’ll get back to your right away. 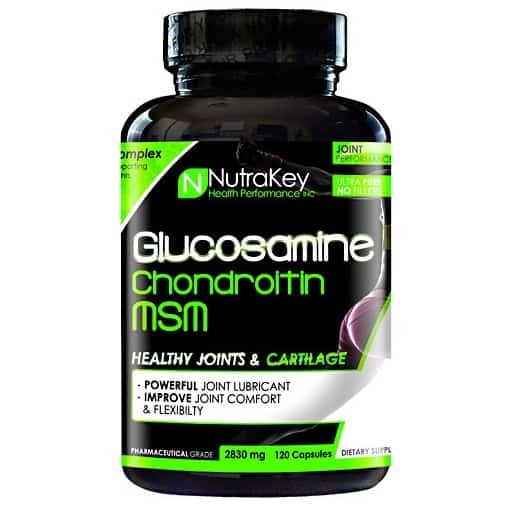 Who Should Take Nutrakey Glucosamine/Chondroitin/MSM? Any adult with achy joints, whether it’s from years of heavy squats and deadlifts, Crossfit WODs, high impact sports, or any other activity. The ingredients in this supplement appear to work together, decreasing inflammation and pain in your achy joints. Some of the ingredients in this study work by getting into your cells. The other work more from the surface. Together they help you feel less pain and continue to workout hard, and get stronger. 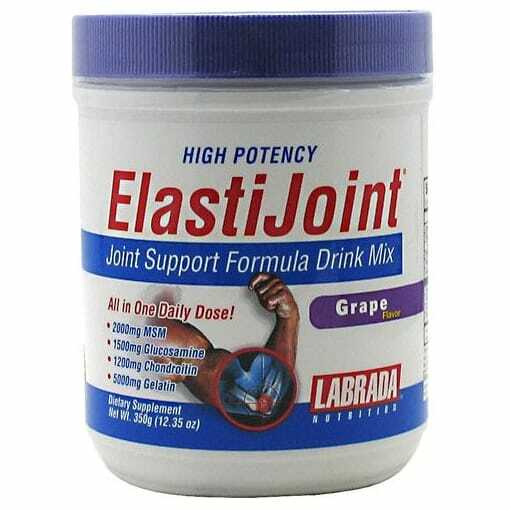 Another way Nutrakey Glucosamine, Chondroitin, MSM works is by rebuilding and even stimulating the growth of new cartilage in your joints. This can help to replace what we’ve lose over years of wear and tear. Research finds that the ingredients in this study are safe for healthy adult men and women to take. Since glucosamine is made from the shells of shrimp and other shellfish, it may not be safe to take if you allergic to these foods. As always read the warning label for this supplement and speak with your doctor before taking this or any other nutritional supplement. Nutrakey recommends taking 4 capsules in 1-2 servings every day. You may find it works better taking it with food. When taken regularly, you should begin to notice benefits in about 30 days. You can expect to see its full benefits within 3 months. If you want something to decrease the pain faster, you may want to try Oximega Fish Oil. The omega 3 fats are also shown quickly relieve inflammation and joint pain. I think it’s important to think about long term benefits from this supplement. After a few short months you should be able to decrease the pain you feel and also improve the mobility and health of your joints, without taking any prescription or over the counter pain killers. 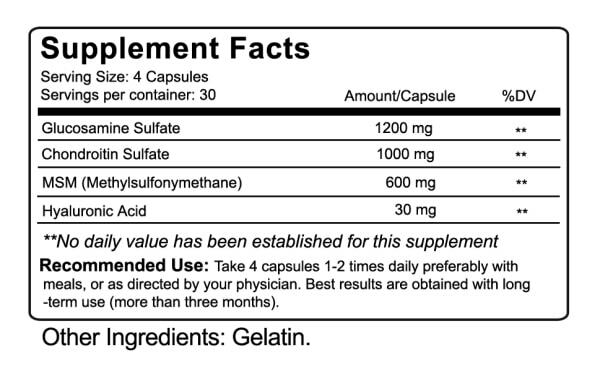 Does This Product Contain Aspirin, Acetaminophen, Or Other NSAIDs? No. The only ingredients in this supplement are glucosamine sulfate, Chondroitin, hyaluronic acid, and methylsulfonylmethane (MSM). All of these nutrients are found in the foods we eat and are 100% natural. Now you know all there is to know about what’s in Nutrakey Glucosamine, Chondroitin, and MSM capsules and how it can benefit you. All that remains is for you to give it a try. Once you do, please leave a review above to let everyone know what you think. Bannuru RR1, Osani M2, Vaysbrot EE2, McAlindon TE2. Comparative safety profile of hyaluronic acid products for knee osteoarthritis: a systematic review and network meta-analysis. Osteoarthritis Cartilage. 2016 Aug 2. Debbi EM1, Agar G, Fichman G, Ziv YB, Kardosh R, Halperin N, Elbaz A, Beer Y, Debi R. Efficacy of methylsulfonylmethane supplementation on osteoarthritis of the knee: a randomized controlled study. BMC Complement Altern Med. 2011 Jun 27;11:50. Hochberg MC1, Martel-Pelletier J2, Monfort J3, Möller I4, Castillo JR5, Arden N6, Berenbaum F7, Blanco FJ8, Conaghan PG9, Doménech G10, Henrotin Y11, Pap T12, Richette P13, Sawitzke A14, du Souich P15, Pelletier JP2; MOVES Investigation Group. Combined chondroitin sulfate and glucosamine for painful knee osteoarthritis: a multicentre, randomised, double-blind, non-inferiority trial versus celecoxib. Ann Rheum Dis. 2016 Jan;75(1):37-44. Hochberg MC1, Martel-Pelletier J2, Monfort J3, Möller I4, Castillo JR5, Arden N6, Berenbaum F7, Blanco FJ8, Conaghan PG9, Doménech G10, Henrotin Y11, Pap T12, Richette P13, Sawitzke A14, du Souich P15, Pelletier JP2; MOVES Investigation Group. Raynauld JP1, Pelletier JP1, Abram F2, Dodin P2, Delorme P2, Martel-Pelletier J3. Long-Term Effects of Glucosamine and Chondroitin Sulfate on the Progression of Structural Changes in Knee Osteoarthritis: Six-Year Followup Data From the Osteoarthritis Initiative. Arthritis Care Res (Hoboken). 2016 Oct;68(10):1560-6. Zeng C1, Wei J2,3, Li H1, Wang YL1, Xie DX1, Yang T1, Gao SG1, Li YS1, Luo W1, Lei GH1. Effectiveness and safety of Glucosamine, chondroitin, the two in combination, or celecoxib in the treatment of osteoarthritis of the knee.